This award was established by the family of Dr. Bruce M. Eberhart to honor exceptional students in the Biology Department who are academically excellent, actively involved in research, and demonstrate significant extracurricular contributions or service to the department, the university, the community as a whole, and even to fellow species they share the planet with. The award was established in 1997 to honor the memory and many contributions of Dr. Eberhart, a cancer victim, to the Biology Department and the community by honoring the students who are contributing to the department and the community in ways that were typical of him. The award is presented to graduating senior biology students and consists of a cash honorarium and a book, which is chosen to repersent contributions to science and humanity by outstanding individuals or biological scientists. This serves, then, as an inspiration to young biological scientists just starting in their careers. The Eberhart Award fund provides not only the cash honoraria but also scholarship support for undergraduate research. The book presented to the Eberhart Award winner in 2013 was Letters to a Young Scientist by Edward O. Wilson. From the book’s dust jacket we learn from Dr. Wilson that, “First and foremost, I urge you to stay on the path you’ve chosen, and to travel on it as far as you can. The world needs you — Badly.” The issues about the encouragement of young scientists raised by this book are definitely what Dr. Eberhart would have been concerned about and thus this was the volume chosen for the award winners. 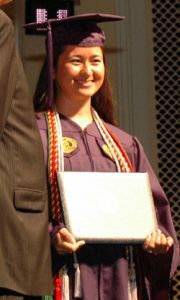 Katharine Ashley Walston – a member of the Beta Beta Beta national honor society in biology and has received disciplinary honors at the Lloyd Honors College. She has been a research assistant for the NC Box Turtle Project. Furthermore she is President of the UNCG Biology Club which sponsors many service activities, such as stream cleanup, volunteering in hospitals and animal shelters. She initiated the Biology Club community garden (she has been observed working in it, watering, weeding, etc. very often), arranges for guest speakers and organizes fundraising events. She expanded this role as Garden Manager through the university Office of Leadership and Service Learning in which students have been trained in the arts of gardening and the vegetable garden harvest has been donated to the Servant Center in Greensboro. She has a strong commitment to environmental conservation and environmental education. Thus, she has done extensive volunteering for the Karen Beasley Sea Turtle Hospital, the Triangle Wildlife Rehabilitation Hospital, and as a Carolina Tiger Rescue Extern. Apparently, she relates candidly, many people think it is cool to have a wild tiger as a pet until they realize what they have gotten into and neglect the animals. This is where tiger rescue comes in and and with it Katherine’s involvement. She is certainly brave in this endeavor! Thus the Eberhart Award committee had little difficulty in making her the award recipient for 2013.